USS Ronald Reagan (CVN 76), USS Nimitz (CVN 68) and USS Theodore Roosevelt (CVN 71) sail together to demonstrate the U.S. Navy's unique capability to operate multiple carrier strike groups. The USS Ronald Reagan (CVN 76), USS Nimitz (CVN 68) and USS Theodore Roosevelt (CVN 71) strike groups will commence a three-carrier strike force exercise in the Western Pacific, Nov. 11-14. Units assigned to the strike force will conduct coordinated operations in international waters in order to demonstrate the U.S. Navy's unique capability to operate multiple carrier strike groups as a coordinated strike force effort. While at sea, the strike force plans to conduct air defense drills, sea surveillance, replenishments at sea, defensive air combat training, close-in coordinated maneuvers and other training. 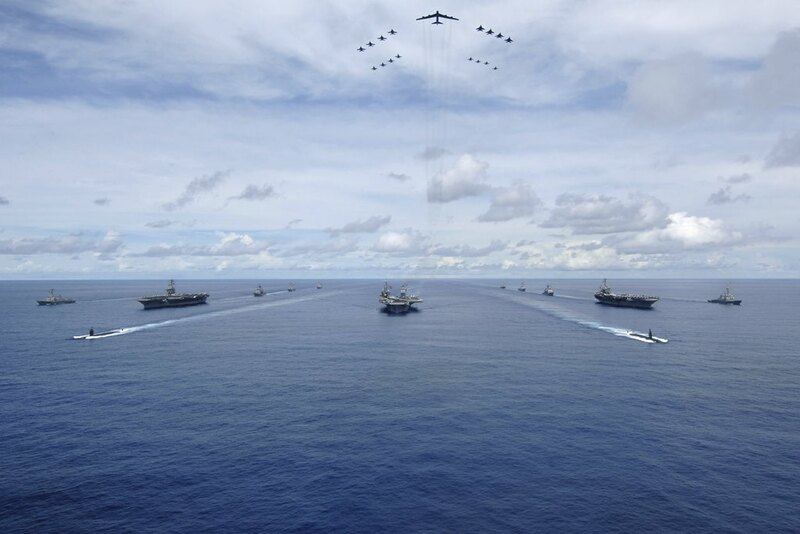 This is the first time that three carrier strike groups have operated together in the Western Pacific since exercises Valiant Shield 2006 and 2007 off the coast of Guam. Both exercises focused on the ability to rapidly bring together forces from three strike groups in response to any regional situation. Ronald Reagan took part in VS 2006 and Nimitz took part in VS 2007. More recently, U.S. Navy aircraft carriers have conducted dual carrier strike group operations in the Western Pacific including in the South China Sea, East China Sea and Philippine Sea. These opportunities typically occur when strike groups deployed to the 7th Fleet area of operations from the West Coast of the United States are joined with the forward deployed carrier strike group from Japan. For more than 70 years, the U.S. Pacific Fleet has been a persistent and stabilizing presence conducting operations throughout the region. The fleet is just as committed to maintaining those security commitments for the next 70 years.